Or just identify these objects (for lack of a better word) that were laid out on newspaper in front of the huge market here in Saigon. I inspected them as closely as I could without being rude or having to buy any. I saw someone pick them up later, and they didn’t look as floppy as fish or as firm as bread. The apartment search continues and it has become all-consuming. It seems that all we do is look at and talk about apartments. A few people have picked places already, but the rest of us are still in limbo. It can’t go on much longer though. Our hotel room has no exterior light and is starting to feel like a dungeon. The hot water runs out quickly (I thought hotels had an endless supply.) And, every once in a while it sounds like someone just dropped a wheelbarrow full of pipes somewhere in the ceiling or wall. We’re both sick of unpacking and repacking so we’re just living off of whatever we can skim off the tops of our bags. Almost everything is dirty, and if it isn’t, it’s been hanging out with dirty clothes for long enough to seem dirty. We both bought clothes yesterday just to have something presentable to wear to dinner. In spite of my sour attitude toward hotels, ours is nice and is on Dong Koi, the main drag through District One/Downtown Saigon. You can find any brand name and designer, plus every local craft, silk, pearls (or are they “pearls?”), Good Morning Vietnam t-shirts, guidebooks, and food from many countries, all at exorbitant prices. There is one shop caddy-corner to us that has fairly well made clothes at Target prices. This is where we were driven by dirty laundry induced desperation. I browsed the racks; doubtful they would even have anything that fit me. I finally found a dress that seemed fairly possible, and went for the M(edium.) As is always the case every time I go into any store, there was a sales person/shop owner standing at my elbow silently watching me. She took the M from me and put it back on the rack saying “L for you.” Nice… The L did fit (and scarily enough, the XL did too,) but I guess I’ll never know if I could squeeze into the M.
Since we must always eat, regardless of the madness in the rest of our lives, I’ve continued to have wonderful food at every meal. The scary factor has been down lately – which is kind of a nice break. On Sunday night the Saigon branch of the ladies of Air Mekong went to dinner together. The restaurant was called Zanzibar, and was chosen partially because it was close enough to the hotel to run there without getting soaked. It was a classy joint, and the food was amazing. 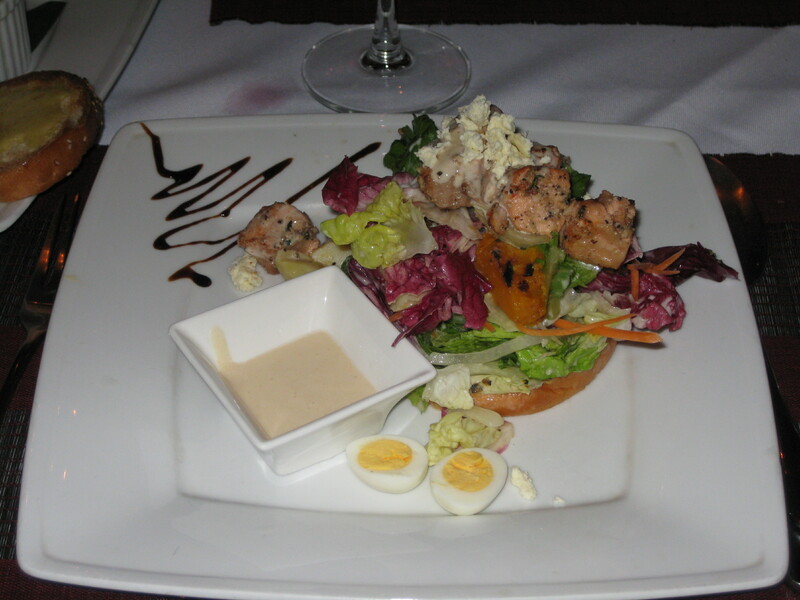 We shared a baked brie, and I had a lemon pepper salmon salad – complete with two little hard boiled quail eggs cut in halves. I won’t lie. They were really cute. We were, once again, perplexed by the fact that wine by the glass is cheaper than buying a bottle. I don’t understand the economics of it, but it’s nice not to feel like you’re getting ripped off if you get two glasses instead of a bottle. Since we dine out at practically every meal we’ve learned a thing or two about restaurants in Vietnam. The first thing is that they have no qualms about rearranging the entire restaurant to suit your party. No one rolls your eyes when you want to take that table, that table, and that table, and put them together over there. They don’t tell you it breaks fire code or messes up the serving sections. They usually do it without you even having to ask. It’s wonderful. The other thing they do is less wonderful. After you’ve been sitting at the table for approximately 30 seconds someone comes to take your drink order. (This is, of course, assuming they speak English and ask you anything.) There aren’t usually that many drink options so we can scramble and make a selection. We all go back to our menus and conversation, and after a bit realize they are still standing there -expectantly waiting for your food order. Telling them to come back is useless. They just stand there looking at you and waiting. For someone like me, who does not specialize in decision making, this becomes stressful. I feel rushed and get more confused about what I want. Asking for suggestions is usually pointless (recommendation and favorite probably aren’t the most common English words to learn.) Several times I have had the server tell me something was good, and then go ahead and write it down as my order. If you change your mind after they have already written your original selection down, just count on getting both things. There is no such thing as ordering an appetizer or a dessert ahead of time. Food gets there when it gets there. Sometimes after half the party has finished eating. It’s difficult for those of us who were taught not to start eating until everyone’s food has arrived. None of these things are bad. Maybe it’s meant to prolong the meal. Maybe it just doesn’t matter to them. They have that right serve us however they like since we are in their land. These are just more of the differences that keep life interesting. 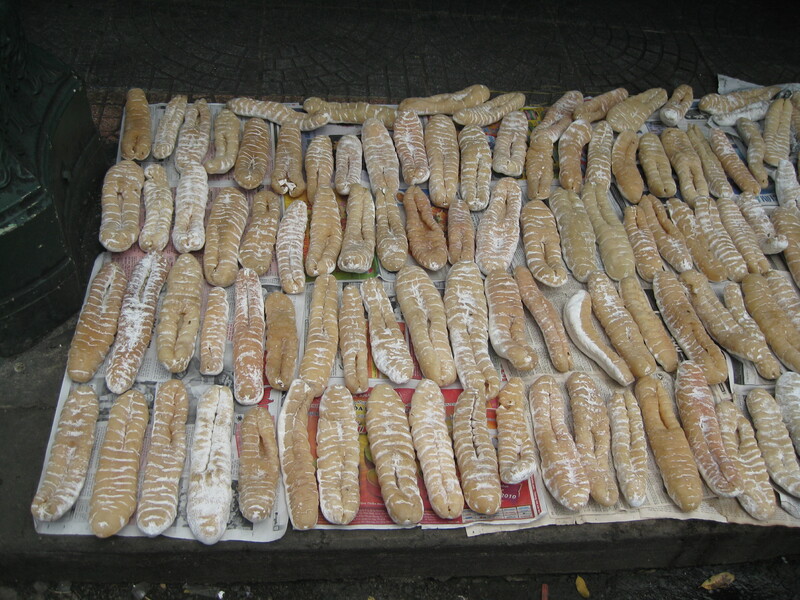 I think it might be dried sea cucumber? That’s a traditional style of Vietnamese footwear, if I’m not mistaken. I think it’s sea cucumber, but I’ve never seen it this color. Do the locals eat family style, that is with many shared dishes in the middle of the table instead of individual entrees? I think this is the reason the food never comes out in order, or at one time for the entire table here in China. Just forget your good manners and let them stand there while you take your time ordering (more China based advice).